Visiting Las Vegas for CES? If you haven’t decided on where to stay, you might want to look at ARIA Resort & Casino - the smartest hotel on The Strip. With its seamless mobile check-in, best-in-class Wi-Fi and in-room tablets with features such as customizable room controls and room service ordering, and, in case you haven’t heard, 16 world-class restaurants by acclaimed chefs and experiences create an evening to elevate your Las Vegas experience. 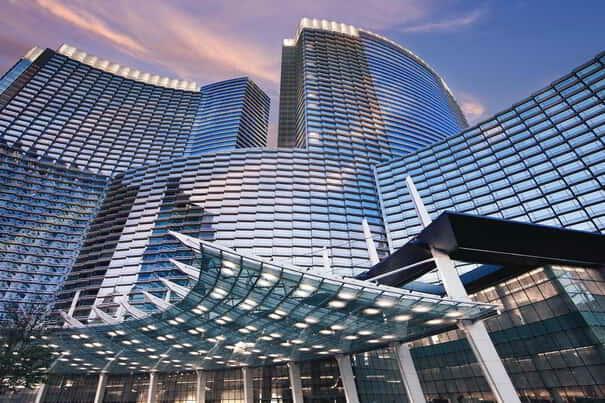 We know there’s the Vegas you’re used to, but then there’s the AAA Five Diamond–awarded ARIA Resort & Casino. While you’re at our resort, the only time you’ll lift a finger is when you raise your hand at a game of poker in our expansive casino floor. Outside of the casino, spend leisurely time sipping expertly crafted cocktails poolside by day and, at dinner, let a Michelin chef do the cooking. After a night of revelry, relax in comfort and luxury with countless indulgences at your fingertips via the revolutionary in-room tablet. In our suites, one-touch everything through the tablets allows you to control nearby amenities like the lighting and curtains, ordering breakfast in bed, booking a spa treatment and ending the day with the tap of a “goodnight” button. To further enhance the experience, each room is equipped with sleek tablets, which make it easy to confirm restaurant reservations or order room service and manage in-room controls such as personalized ambiance settings with just one touch. 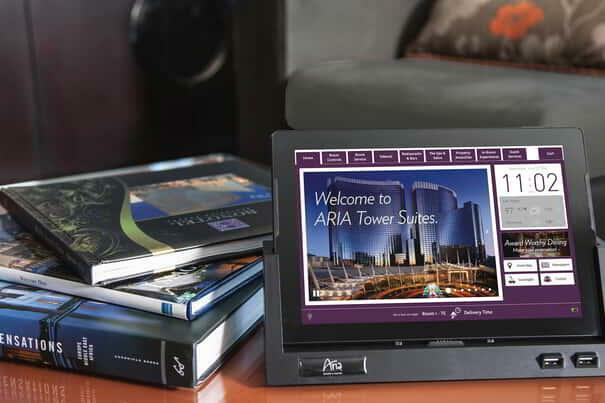 Guests can even use the tablets to plan things to do at ARIA like book spa services, view the latest news in multiple languages, and schedule the arrival of personalized experiences and packages for the room. More than just hotel suites, there is so much more to why ARIA is the smartest hotel on The Strip. Even our meeting spaces are different. Stepping into the convention center gives attendees a spectacular view overlooking the pool through the floor-to-ceiling glass wall. It’s not just pretty, the glass lets light in but it’s made of sustainable materials to keep heat & UV waste out. 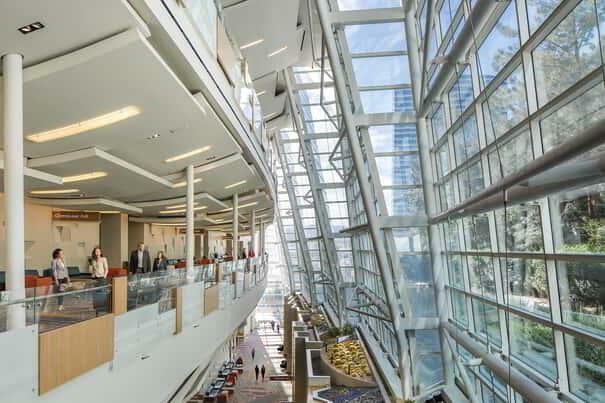 Beyond our green initiatives for the convention center, a recent remodel to the already high-tech space includes enhancements such as media walls, news tickers, plenty of recharge areas, and industry-leading Wi-Fi making it the perfect place to host your next event. In 2018 there will be an expansive 20,000 square foot addition to the already grand hall. Discover a culinary and nightlife adventure to surpass all of your expectations of what Las Vegas should be. At ARIA, our incredible selection of venues offer everything your senses could desire, from world-acclaimed fine dining by Michelin star chefs to unique nightclubs with legendary guests manning the DJ booth. Whether you’re on your own or hosting a VIP group of attendees, the restaurant and group dining options at ARIA are no less than extraordinary. Taste an ever-changing menu of contemporary American cuisine at Sage, by James Beard Award-winning chef Shawn McClain, or indulge in Carbone’s timeless Italian that will transport you to the era of glamor, showmanship and tableside service. If you’re looking for al fresco dining, look no further than the ocean-to-table restaurant concept Herringbone featuring California-inspired coastal cuisine open for lunch, dinner and brunch. For those looking to keep the energy going during the downtime of CES, ARIA has nightclubs and lounges where all the cool kids come to see and be seen. When the sun sets until the sun rises again, escape to ALIBI Ultra Lounge and enjoy premium spirits amidst chic and stylized décor. Check out newly opened CATCH, the only location to bring epic renditions of Asian-influenced sushi, seafood and steak. With the lounge open until 3:00 AM, you can come for dinner, and stay late night. The night owls will want to experience an unforgettable party life at JEWEL Nightclub. Spanning more than 24,000 square feet, JEWEL is an evocative and rare experience, featuring world-class headlining DJs and stunning performances that will move you until the early hours. All of this, and we’ve just scratched the surface. No matter your craving, there is something at ARIA Las Vegas to satisfy it. Because at ARIA, - this is how we vegas™.